Frequently asked questions about Windsong Jewellery Design. 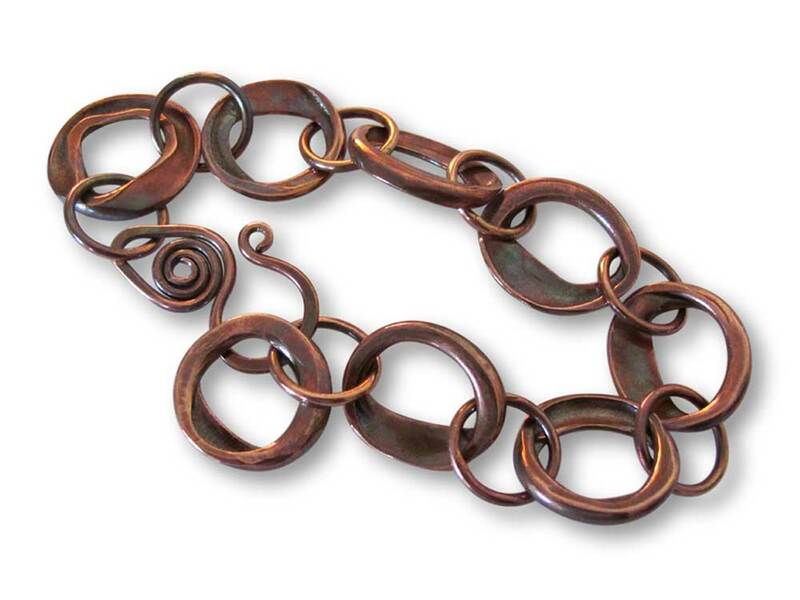 We use Argentium® silver, sterling silver, copper, and brass. 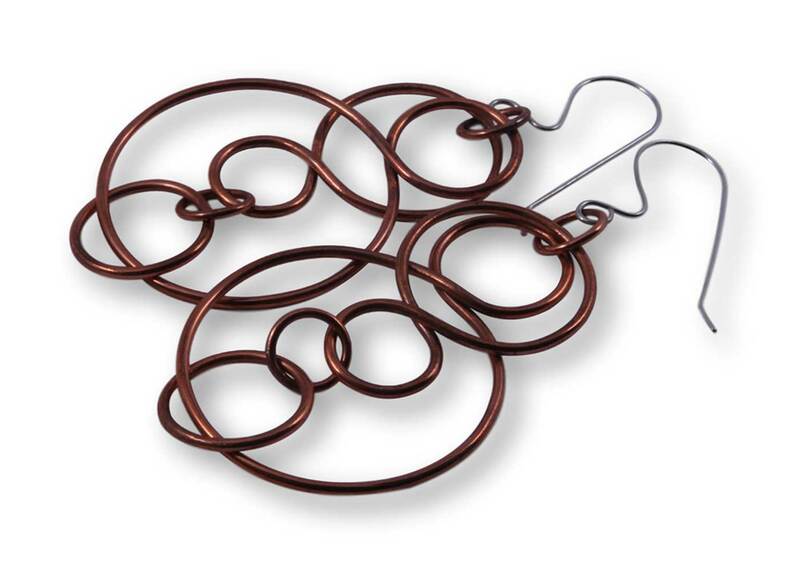 All pieces are created using traditional metalsmithing techniques, from sheet metal and wire. 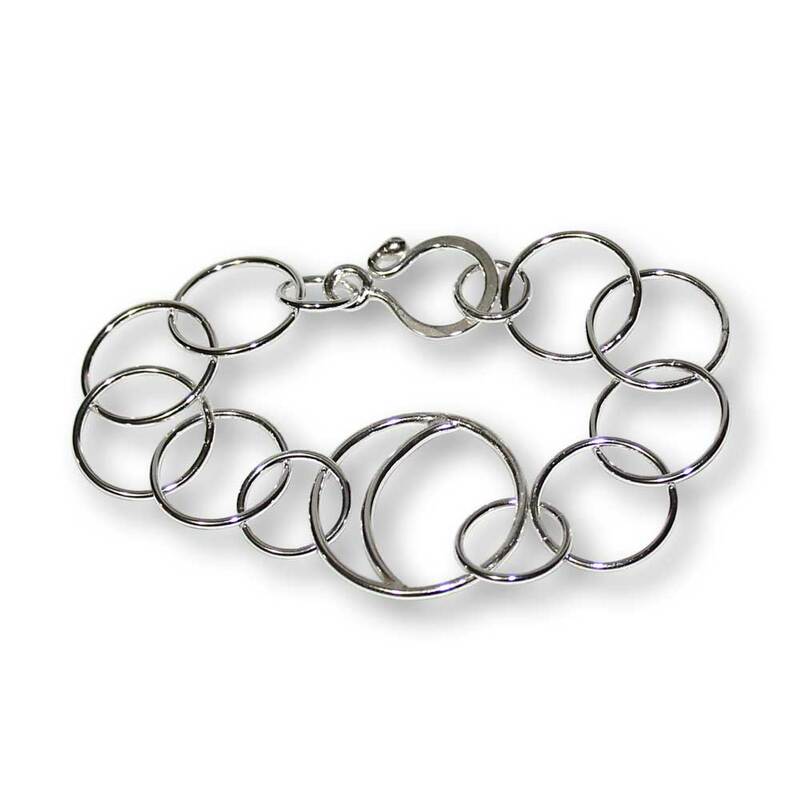 In some pieces, commercially-made Italian sterling silver chain is incorporated, when the added labour and expense of a handmade chain is not feasible. What is the difference between traditional sterling and Argentium silver, and why should I care? Traditional sterling silver contains 92.5% pure silver (this is where the “.925” comes from), with the remaining 7.5% being copper. If sterling tarnishes, it’s the copper content that causes it. The Argentium® silver we use, on the other hand, contains either 93.5% pure silver, and some of the copper has been replaced by a metal called germanium. This results in a highly-tarnish resistant metal that is brighter and whiter than platinum, white gold and traditional sterling. Argentium® is hypoallergenic and antibacterial, making it a perfect choice for those who are unable to wear base metals or even sterling. Windsong Jewellery Design’s studio is located in a quiet suburb of Vancouver, British Columbia. Although the studio is not open to the public, we welcome people to meet with us by appointment at a mutually-convenient location. How can I find out about new products, upcoming shows, etc.? You can find us on Facebook, Instagram, Pinterest, and Twitter. You can also keep up to date by subscribing to the newsletter – otherwise known as becoming a “Windsong VIP” (don’t worry, we won’t fill up your inbox!). Most pieces are handmade to order, and therefore slight variations are to be expected from photos on the website. Some pieces are one-of-a-kind, and you will receive the actual item shown. In all cases, due to the handmade nature of the work, you can take pleasure in the knowledge that your Windsong treasure is unique and special – you will never find hundreds of other people wearing the exact same piece! If you are not thrilled with your purchase, or if an item is damaged during shipping, you are welcome to return it for a full refund of the purchase price (not including shipping and handling). You must notify us of your intent to return your item within 24 hours of receipt of the package, by email at info@whoiswindsong.com. Item must be returned in original new, unworn, resaleable condition. Do you require a deposit for custom orders? If you don’t see exactly what you are looking for, please do not hesitate to contact us so we can discuss variations to an existing design, or a completely new piece. The custom process is a collaborative effort, with the exchange of ideas, sketches and progress photographs, which will result in a very special piece that you can truly call your own. A deposit is required on all custom orders, based on 50% of the initial estimate. The final cost may change, depending on the number of revisions or adjustments requested. The balance is due upon completion of the order, which will be shipped once the invoice is paid in full. Windsong Jewellery Design is not responsible for any Customs clearance fees, brokerage fees, taxes or duties you may incur, so please know your country’s policies in this regard. Your order will be carefully packaged and padded to ensure safe delivery. The package labeling will not mention “jewellery”, in order to maximize the privacy and security of your order. Windsong Jewellery Design is not responsible for lost/stolen packages unless insurance is requested at time of purchase. Rush shipping is available upon request – please contact us for an estimate prior to making a purchase. All items are shipped via Canada Post’s Expresspost service. Shipping within Canada is free with minimum $150 purchase. Personal delivery within the Greater Vancouver area is available for an additional $25CAD. All pieces are handmade to order, so please allow 3-4 weeks for delivery. If you require a faster turnaround time, please contact us at sales@whoiswindsong.com, or call us at 778-839-1773, and we will do our best to accommodate your needs. A rush fee will apply, and will be based on complexity and time constraints. Most major credit cards are accepted, via our secure online shopping cart. Goods and Services Tax (“GST”) and Provincial Sales Tax (“PST”) or Harmonized Sales Tax (“HST”) will be applied to all orders originating within Canada, and are charged based on the client’s province or territory of residence. Yes! If you are interested in carrying Windsong Jewellery Design in your store, please email us at sales@whoiswindsong.com. Be sure to include your name, website, contact information, and tell us a little about your store. We look forward to hearing from you. In the event a product is listed at an incorrect price due to typographical error or error in pricing or product information received from our suppliers, we reserve the right to refuse or cancel any orders placed for product listed at the incorrect price. We reserve the right to refuse or cancel any such orders whether or not the order has been confirmed and your credit card has been charged. If your credit card has already been charged for the purchase and your order is cancelled, we shall immediately issue a credit to your credit card account in the amount of the charge. Pictures shown are representative, as all our jewellery is handmade to order, and each piece will vary slightly from the photos. If you have any concerns about this, please contact us to inquire further. All jewellery designs are copyrighted by Windsong Jewellery Design, and may not be reproduced or copied. We welcome pinning or posting of individual images to Pinterest, Instagram, Facebook and other social media sites, provided proper attribution is included. Please tag us with @whoiswindsong and #whoiswindsong. We will never sell, rent, or otherwise disseminate any of your private information to any person or business. Any information we collect about you via site registration or our order process remains securely with us. We may send newsletters or other material electronically from time to time, but you will always have the option of opting out by following the “unsubscribe” link at the bottom of the email. We may employ the use of tracking cookies to enable a smoother browsing experience. These cookies do not transmit any personal data to us, but simply store the pages you have visited, on your own computer, so that you may access your own history faster during your visit. We do analyze general website traffic patterns, but collect no personal information while you are visiting our site. Your email address and any other personal information you may share with us will never be sold or provided to a third party. We value you, and we value your privacy, so it’s simple: We don’t share. Have a question that is not answered in the FAQ above? Contact us now using the form below, or send us an email at info@whoiswindsong.com.